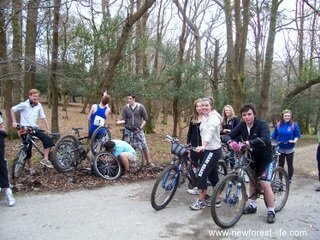 Cycling activities New Forest great fun for all the family! Off road fun you'll love! Cycling activities New Forest are boundless! This stunning National Park offers you and your trusty bike, over 100 miles of Forestry Commission owned off road cycle tracks. The gradients all vary but virtually all are all-terrain gravel type cycle routes and trails. What more could you ask for? Can I just ask you one thing please? You will encounter free roaming animals wherever you cycle. It's their habitat and they have the road and cycle sense of a pea so please watch your speed and be very careful of them and for yourselves. My New Forest cycling sermon is now over! What better way to really experience and explore this beautiful area? Here are some of my personal recommendations for your New Forest cycling adventure on two (or more!)wheels. The main areas I've covered here are: Brockenhurst, Bolderwood, Burley, Lyndhurst and Fordingbridge and the N.W. area. If you need to hire a bike it couldn't be simpler. 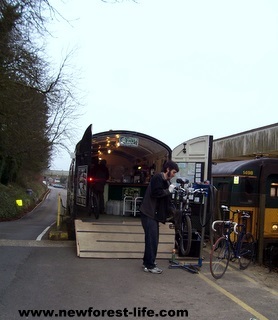 Cyclexperience offer two locations in Brockenhurst, both close to the railway station so you can come by train or car. You can hire or even buy your bike here and as much gear as you might need. Offer Corporate Days - chill out or team build! Country Lanes is an active travel company for your cycling activities in the New Forest. They are based in a railway carriage right beside the Brockenhurst railway track! As well as hiring a bike here you can book your cycling holiday. 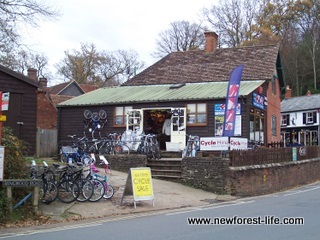 This is a very popular village too for cycling activities New Forest. 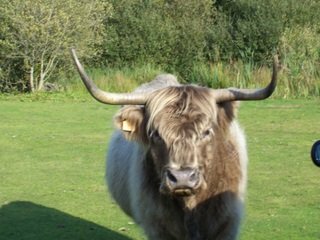 It has lots of lovely trails to follow to really enjoy the New Forest up close! Burley village is well known for its witches, as you will see from some of the shops when you arrive. Hopefully you wont encounter any on your New Forest cycle! You also combine 2 New Forest activities here and have a go at horse riding. You may find it hard to walk for a few days after so much leg action though! It's also got some good Tea Rooms I can recommend. Cycling activities in the New Forest in this area means being away from the main tourist areas and one of my favourite places for New Forest cycling . It is a quieter area and so you should encounter less traffic as you puff up and down the hills on your bike. I often meet families having a wonderful day out. The road traffic that you may encounter is mainly local people just getting about and so you should be able to stop easily, park the bike and have a good look at the animals. If you don't see a donkey on this cycle, I'll be surprised. The best place to hire a bike for a great day out in this area is at the Sandy Balls Holiday Centre, one of the best New Forest cycling and bike hire centres for all the family. Your cycling activities New Forest will be well covered here. 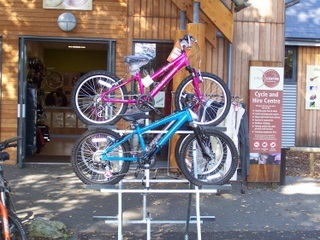 If you arrive with your own bike they are also great at bike repairs...... and for biking gear too. Why does your chain break at the furthest point from home when you're out - usually after you've just left the pub? Find out more from my Sandy Balls New Forest Bike Hire page or do you want to go directly to Sandy Balls Bike Hire? You can even base your holiday at the Sandy Balls Holiday Centre if you want. Discover my lodges recommendations and ready tent pitches, and you can use their great leisure facilities, if you decide to stay here for your cycling activities in the New Forest. Add to all this the beautiful woodland surroundings and cycling will be just one of the New Forest activities you do if you stay here. The New Forest Tour sightseeing bus picks up at Sandy Balls, during the summer only and you can take your bike. 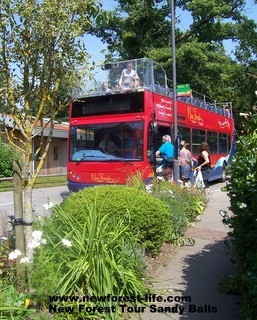 It's a great way to see the New Forest from an open top sightseeing bus. My Suggested Routes gives more details of just some of the tracks and trails you can chose to follow for your Cycling activities in the New Forest. I explain how long, how hard and where they start and finish. 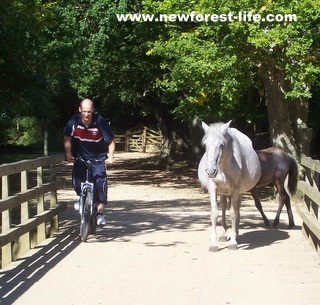 You can also use the cycling activities routes below to discover the New Forest up close! The New Forest District Council site has some good maps and trails for you to follow. this is a large document and loads quite slowly so you may want to ignore it! You can always get lots of helpful details of other New Forest activities on offer at the various information points in the New Forest. Here are some top routes which can be included in your holiday if you want to go further afield than the New Forest for your cycling experience. The troll trail between Merstone and Shide is well surfaced, traffic free, and perfect for children who love magic and trolls. The trail has troll carvings and other types of art for them to take in all along the trail - and a good excuse for a break as you all get your breath back. This is flattish and a round the island cycle, which means 62 miles so you must be fit and have a good bike. The sights are to die for and you wont believe where you are. Discover all the routes, get maps and ideas for your great time out on the Isle of Wight island cycle experience. The North Wiltshire Rivers Route is quite long, at 25 miles but also includes some magic! It is on quiet lanes and off roads near Lacock Abbey, where Harry Potter was filmed. The Purbeck Ride includes wonderful coastal views, history including Corfe castle and rural idylls. This is a 47 miles ride and so is not for the novice. If you meet anything like this get off and run! Only kidding, like all the cycling activities New Forest I'll recommend, a day on your bikes is just another one where you need to be aware of the animals and take care when out on your bike. Hopefully you can choose cycling as one of the New Forest activities to do when you visit the forest and take home a truly memorable experience and not too many saddle sores! Hire the bike, choose the route, put on your biking gear and include a pub stop and you'll have a day to remember. Happy New Forest cycling! Enjoy your cycling activities New Forest and take home memories to remember forever. Cycling activities New Forest is an ideal place to raise funds for charity in a safe, mainly road free environment, close to wildlife, it is also very exhilarating and allows you to experience the forest in more detail. The photo above shows sixth form students enjoying a sponsored ride out on off road tracks whilst raising funds for The Libra Foundation. Find out more about The Libra Foundation and how you may be able to help raise funds for children in Romania through a sponsored New Forest cycle.